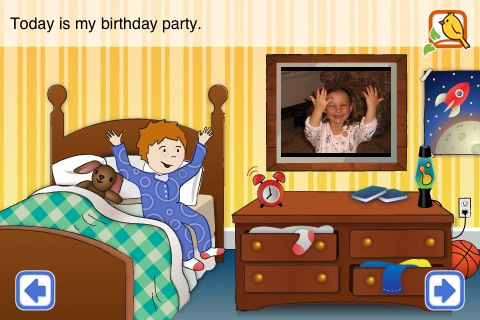 Scott Singer’s new app, Build a Birthday Brag Book lets you create and record your kid’s Big Day. This app includes pictures everything a child will experience on their birthday. You basically edit each page of the “story” with personal touches. The story begins with a little boy waking up on his birthday. I’ll give you an example of the first page of the app so you can get an idea of the layout. On the screen you’ll see a mirror above the little boy’s dresser, this is where you can post a picture of your child waking up the morning of their birthday. You can also record a short audio clip and post a caption at the top of the screen. All of the pages in the story have the same options; the second page is a picture of a cake recipe with a small box in the book to post a picture of the birthday cake you’ve made; and the third page is of guests arriving to the party, etc. I went through the iPhone app and made a little birthday story of my own to review it. I built my brag book, posting pictures, including audio and captions. On each page there is an option to post your story to Facebook, Twitter, edit your story, save the current frame to your photo album, or email it. However, when I went through it after I was finished, I was a little disappointed because the screen shot I was editing wasn’t the same as the finalized screen shot that contained my edits. For example, on one particular page there is a view of the birthday child looking down at a board game and friends sitting across the table, but on the finished and edited paged, there was a different view with no board game. Not that big of a deal, unless when your making you book, you’re referring to the illustrations on the page that won’t exist on your final book. Also, I think the developers could add a more interactive, personal touch to the characters of the story by allowing us to customize the image of the child in the book. I didn’t mind that I started out in the story as a little boy, but I think I would have been upset when I was a little girl. I’m all about iPhone apps that make your life easier, and I’m completely open to discovering new ones, if only for the sake of entertainment. I think it’s great that there are so many apps out there for so many different kinds of people. But at some point, I hope a developer will look at the app they’ve just created and really consider, “would people actually use this?” I can’t see this app, as it functions right now, being very useful or entertaining. The developers are going to have to beef this one up quite a bit before I’d consider using it. AppSafari review of Build a Birthday BragBook was written by Amanda McFarland on May 21st, 2010 and categorized under App Store, Education, Fun, Photos. Page viewed 3964 times, 1 so far today. Need help on using these apps? Please read the Help Page.